Since the Lord Jesus carried out His work of redemption in the Age of Grace, we have seen that He is full of tolerance and patience, full of love and mercy. So long as we believe in the Lord Jesus, our sins will be absolved and we will be able to enjoy the grace of God. As a result, we have determined that God is a loving and merciful God, that He is eternally forgiving of man and absolves man of his every sin, and that God always treats us as a mother treats her children, with the utmost care, never showing anger. 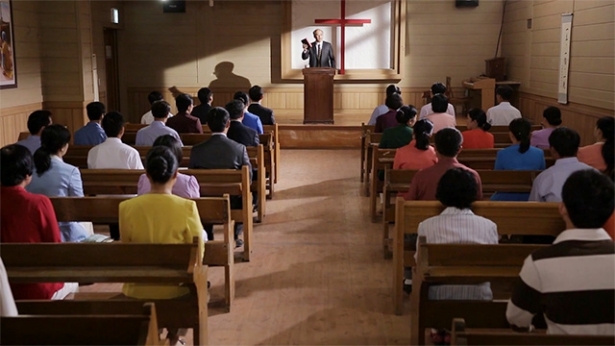 Therefore, many people are at a loss when they see Almighty God in the last days expressing truths and judging man in harsh language that so clearly exposes man’s corruption without any mercy; they don’t understand it when He condemns and curses evil people, antichrists and the Pharisees. They feel that God should not use such harsh language to judge man. The fact that we are capable of harboring these kinds of notions is entirely a result of lacking knowledge of God’s inherent disposition. Whatever disposition God reveals in each age is always based on the needs of His work of saving the human race, and it is also determined by the needs of corrupt humanity. It is all for the sake of redeeming and saving mankind. If we want to understand this aspect of the truth and achieve true knowledge of God’s disposition, then let us read a few passages from the words of Almighty God. Almighty God says, “The work Jesus did was in accordance with the needs of man in that age. His task was to redeem humanity, to forgive them their sins, and so His disposition was wholly one of humility, patience, love, piety, forbearance, mercy, and lovingkindness. He blessed humanity richly and brought them grace in abundance, and all the things that they could possibly enjoy, He gave them for their enjoyment: peace and happiness, His tolerance and love, His mercy and lovingkindness. In those days, all that man encountered was an abundance of things to enjoy: Their hearts were at peace and reassured, their spirits were consoled, and they were sustained by the Savior Jesus. That they could obtain these things was a consequence of the age in which they lived” (“The True Story Behind Work in the Age of Redemption” in The Word Appears in the Flesh). “In the past, His means of salvation was showing the utmost love and compassion, such that He gave His all to Satan in exchange for the whole of mankind. Today is nothing like the past: Today, your salvation occurs at the time of the last days, during the classification of each according to kind; the means of your salvation is not love or compassion, but chastisement and judgment in order that man may be more thoroughly saved” (“You Should Put Aside the Blessings of Status and Understand God’s Will for the Salvation of Man” in The Word Appears in the Flesh). “In His final work of concluding the age, God’s disposition is one of chastisement and judgment, in which He reveals all that is unrighteous, in order to publicly judge all peoples, and to perfect those who love Him with a sincere heart. Only a disposition such as this can bring the age to an end. … Only through chastisement and judgment can the outcome of all creation be revealed. Man only shows his true colors when he is chastised and judged. Evil shall be put with evil, good with good, and all humanity shall be classified according to their kind. Through chastisement and judgment, the outcome of all creation will be revealed, so that the evil may be punished and the good rewarded, and all people become subject to the dominion of God. All this work must be achieved through righteous chastisement and judgment. Because man’s corruption has reached its peak and his disobedience become exceedingly severe, only God’s righteous disposition, one that is principally compounded of chastisement and judgment and is revealed during the last days, can fully transform and complete man. Only this disposition can expose evil and thus severely punish all the unrighteous. Therefore, a disposition such as this is imbued with temporal significance, and the revelation and exhibition of His disposition is made manifest for the sake of the work of each new age. It is not that God reveals His disposition arbitrarily and without significance. Supposing that, in revealing the outcome of man during the last days, God were still to bestow upon man infinite compassion and love and continue to be loving toward him, not subjecting man to righteous judgment but rather showing him tolerance, patience, and forgiveness, and pardoning man no matter how grave his sins, without any jot of righteous judgment: then when would all of God’s management ever be brought to a close? When would a disposition such as this be able to lead people into mankind’s appropriate destination? Take, for example, a judge who is always loving, a judge with a kindly face and a gentle heart. He loves people irrespective of the crimes they may have committed, and he is loving to and forbearing with them whoever they may be. In that case, when will he ever be able to reach a just verdict? During the last days, only righteous judgment can classify man according to their kind and bring man into a new realm. In this way, the entire age is brought to an end through God’s righteous disposition of judgment and chastisement” (“The Vision of God’s Work (3)” in The Word Appears in the Flesh). Having read these words from Almighty God, what can we see regarding the disposition God revealed in the Age of Grace? What disposition does God reveal in the Age of Kingdom? Are the dispositions of God as revealed in the Age of Grace and the Age of Kingdom the same? It was in the Age of Grace that God did His work of redemption, wherein He revealed His mercy and love, His tolerance and patience, as well as His forgiveness and absolution. It was only through this that mankind became qualified to come before God and pray, confess their sins and beseech God. Upon obtaining God’s absolution, they were able to enjoy God’s grace and blessings. In the late period of the Age of Law, despite mankind knowing what sin was and knowing that the laws of Jehovah God would not tolerate any offense from mankind, nonetheless mankind often went against these laws and offended God. In accordance with what the law and the commandments required of mankind, they all should have been put to death under the law. This is why God became flesh and was crucified for mankind in the Age of Grace; He personally bore the sins of humanity, absolving and forgiving human beings for their sins. The Lord Jesus treated His followers just like a mother and father would treat their own sons and daughters: with tremendous care and an unwillingness to cast aside anyone that believed in Him or followed Him. The Lord Jesus revealing His mercy, love, forgiveness, and absolution was so that we could see how real God’s love is for us, how merciful and kind God’s heart is, and how He is considerate of our weaknesses. His love reformed our hearts. It is only through that that we became willing to accept God, come before Him to repent our sins, and obtain God’s redemption. Haven’t we all felt this mercy and love from God? Now that the last days have arrived, mankind already knows of God’s existence and they have enjoyed a great deal of God’s grace. All can be certain that God is redeeming and saving mankind. At this time people are able to accept some truths—the time has come for God to do His work of judgment so that man can be thoroughly cleansed and saved. Because mankind of the last days has been so thoroughly tainted by Satan’s corruption, they are incredibly arrogant and crooked, selfish and despicable, and so terribly evil and greedy. They will stop at nothing for the sake of fame, status, and wealth. They have lost all conscience and reason, they lack any shred of humanity, and even though they believe in the Lord and are forgiven of their sins, their sinful nature and satanic disposition yet remain. This is why all of mankind cannot extricate itself from living in sin. In order to completely save humanity from the evils of sin, God has become flesh as the Son of man in the last days in accordance with the needs of corrupt mankind; He has expressed all truths to cleanse and save mankind. God has carried out a stage of the work of judgment and chastisement, and when He issues forth the truth to judge man, His words will be a bit harsh and will cut to the quick, just like a sharp two-edged sword, fully revealing His righteous, majestic, and wrathful disposition. It is precisely because of God’s judgment and chastisement that we are able to see that His righteousness and holiness will not tolerate mankind’s offenses, and only then will we prostrate ourselves upon the ground and have nowhere to hide. We then realize that we are so thoroughly corrupt and brimming with Satan’s disposition, that we utterly lack reverence and obedience for God, all we do is rebel and go against Him, and that we do not deserve to be in God’s presence. It is only through this that we achieve true repentance and come to know what a true human likeness is, and how one should live out a life of meaning. Through experiencing God’s judgment and chastisement, we are able to understand many truths, develop a heart of reverence and submission to God, know the importance of pursuing the truth as well as the ultimate significance of knowing and loving God; isn’t this true repentance? Isn’t this real change? Without God’s judgment and chastisement, such deeply corrupted human beings would have no way of being cleansed and attaining salvation. We see now that the outcome of God saving and perfecting man can only be achieved by means of His judgment and chastisement. These are the facts. If things proceeded according to what we imagine, God in the last days would reveal the same loving and merciful disposition as the Lord Jesus—could that achieve the outcome of cleansing and saving mankind? If God did not carry out His work of judgment in the last days then we would never be able to truly understand God’s inherent disposition which is mainly based upon His righteousness. Then we wouldn’t be able to receive the truth, attain purification or salvation, or be perfected. In addition, there would be no way to expose and eliminate those unbelievers who do not pursue the truth or those antichrists that hate the truth and are enemies of God. Only God’s righteous judgment can thoroughly expose man and classify each person according to their kind. Only this can thoroughly conclude God’s work of saving mankind. Through reading the word of Almighty God we can come to know that the disposition God expresses in each age is determined based on the needs of the work of saving mankind. Thus, we cannot delimit God’s disposition and His entirety based on the disposition He reveals in any one age. It is because the Pharisees delimited God’s name and rigidly adhered to a set of rules that they resisted and condemned the Lord Jesus, leading to them being punished and cursed by God. We must know God’s disposition by coming to understand His three stages of work. This is the only accurate way to do so, and this is in accord with God’s will. If we concluded that God is loving and merciful based solely on the disposition revealed by the Lord Jesus in the Age of Grace, how could this be true knowledge of God? That would be a very foolish and ignorant way of knowing God. The Pharisees all understood the Bible, but why did they not know God? It was because they defined God based solely on one stage of His work, so when the Lord Jesus came to carry out His work they nailed Him to the cross. This shows how easy it can be to delimit and oppose God if we do not know Him. Previous：Question 17: You testify that in the last days God does His work of judgment in order to completely purify and save man, but after reading the words expressed by Almighty God, I find that some of them condemn and curse man. If God condemns and curses man, isn’t man then to suffer punishment? How can you still say that this kind of judgment purifies and saves mankind? Next：Question 19: It’s written right in the Bible: “Jesus Christ the same yesterday, and to day, and for ever” (Heb 13:8). So the name of the Lord never changes! But you say that the Lord has come again in the last days with a new name and He is called Almighty God. How can that be the case? This is most incompatible with people’s notions. Those who have a share in My house in the future are all people who have been caught up before Me. This is absolutely true, never-changing, and cannot be refuted by anybody. This is the counterattack against Satan. Anyone I preordained shall be caught up before Me. What is called hypocrisy? Under the cover of belief in God and service for God, with a mouth full of explanation of the Bible, speaking some religious doctrines, people neither practice nor seek the truth, nor obey God’s work, speaking nicely but without a bit of true obedience; is this not hypocrisy?